Field naturalists have observed the activities of weasels for centuries. Their descriptions were often accurate but sometimes misinterpreted the animals' behaviors and underlying explanations for those behaviors. 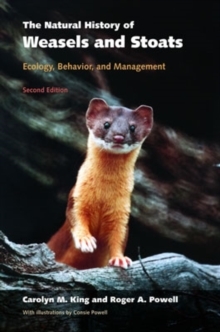 "Organized natural history" became one of the roots of the science of ecology in the 1920s and by the 1960s scientists had begun to study the biology of weasels with all the critical, objective advantages of modern theory and equipment. Until the firstedition of this book appeared in 1989 no one had attempted to explain these results to non-specialist naturalists. Now thoroughly revised, this book will continue to be the main one-stop reference for professionals. But both kinds of knowledge are brought together here- observations for the traditionalnaturalist and rigorous measurements and interpretations for modern scientists, integrated into a single, readable account. This new edition provides a comprehensive summary of the extensive advances over the last 15 years in our knowledge of these fascinating animals. A new U.S.-based co-author reshapes the content to be more U.S.-centric. Stories about North America trappers and backwoodsmen interacting with weasels replace some (not all) of the previous stories about English gamekeepers. These changes permeate the book, so readers familiar with the first edition will recognize some material, but will find a lotthat is new. Much less reliable European information quoted in the first edition was there at the time when no better information was available. Now a new NZ chapter focuses on predation problems of the species introduced to that country. This edition, much more than a simple update, is now truly aninternational treatment and a more valuable resource. Pages: 464 pages, 6 halftones, 98 line illus.